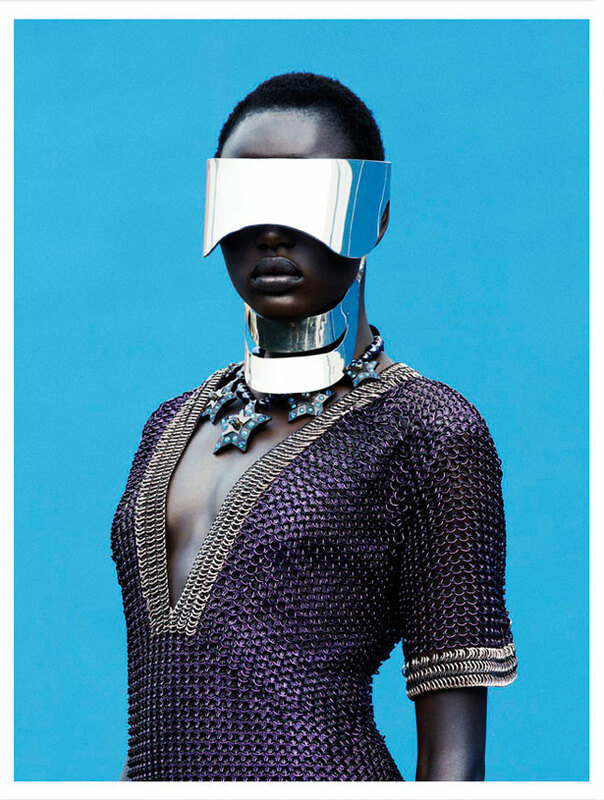 An article by Laura Havlin that appeared in AnOther Magazine back in September is a good source to get acquainted with the afrofuturist aesthetic and to point to its influence on afrosartorial trends. In particular, Havlin notes the correspondence between the afrofuturist concept of non-linear time and the knowledge that space contains multiple geographies of dwelling and belonging. This is one way of pointing to the relevance of diasporic consciousness for cultural production rooted in non-normative embodiment – an otherworldly embodiment that “rearticulate[s] the body that has been dissected, that has been mutated and that has been made to perform”. This consciousness of the metamorphic body forges a “new self-defined visual identity”, setting an aesthetic agenda that pursues ornamentation and impersonation as political acts. an active part of the creative/transformative process. In West Africa, for those Egungun priests who invoke the departed spirits, the self disappears in the wearing of the sacred garment; one becomes a vessel for spirit. Havlin cites African-American singers Grace Jones, Betty Davis, and Janelle Monáe as the movement’s iconic ambassadors for their ability to create alternative personalities that mix mysticism and space-age technology. Their fit bodies dressed in sharp silhouettes, glam outfits that enhance their skin colour, moving against avant-garde scenographic props, make up the signature look of the Afrofuturist woman, whose brand of entertainment is infused with African spirituality. Afrofuturism, therefore, needs dress to activate embodied post-humanism and practice the visual activism that complements the performance. Havlin focuses on the most immediate futurist allure of Jones, Davis, and Monáe’s style, mentioning their “cyber punk” and “part glam” attire. These garments capture and emit the affective charge of the reinvented body in a sartorial performance that electrifies the audience. But what is even more interesting about the Afrofuturist look is that its aesthetic register persists and is immediately recognisable even in the absence of cyberpunk and spiritual references. Steven Shaviro has the perfect words to describe the aesthetic resilience of Afrofuturism. Writing about Grace Jones in Post-Cinematic Affect (2010), he notes that her “iconic singularity … marks the screen” keeping “its material self-retention through all its fluid transformations” (13-14, his italics). Jones’s imaged body is not a figure in implied space, but an electronic signal. […] The screen works as a material support for this signal/image. […] construct[ing] a relational space (16-17, his italics). Make-up and clothes (or lack thereof), stiletto heels and drag attire, are essential to her inversion of racial/gender signifiers, and otherwordly spectacularisation of her body. “She embodies her own extreme objectification, her packaging as a saleable commodity” (Shaviro 21). Through sartorial means, Jones makes metamorphosis attractive and desirable. At the same time, by turning herself into an object, she attains abstraction, moving “beyond identification” (22), concludes Shaviro. Thus Jones effectively creates her own visual brand, bringing the Afrofuturist agenda of visual colonisation to a new level. 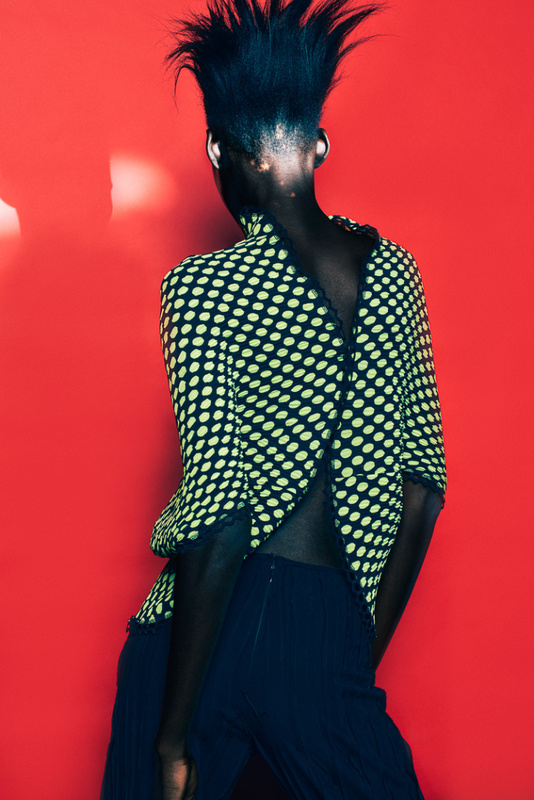 This ability to reach out of the picture, imbuing the black body with vibrations and an all-around non-subjective affective charge of transformation is also what the Afrosartorial aesthetic pursues, albeit to ambiguous effects. 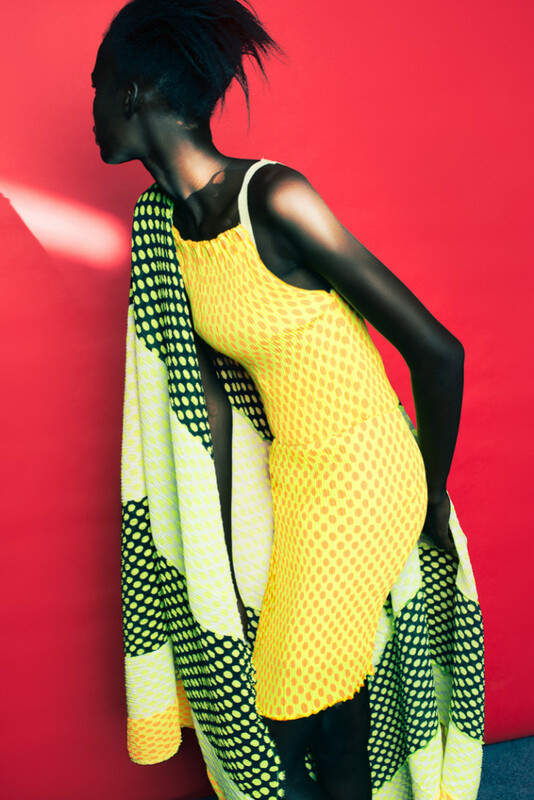 Fashion photography in Africa and non-African designers who feature African models in their lookbooks often rely on a visual register that iconises skin colour and certain bodily features, set against staged backgrounds, producing what look like pictorial renderings of a generic “Africanness”. This is perhaps the most common and shared visual representation of African fashion found on social and print media today. 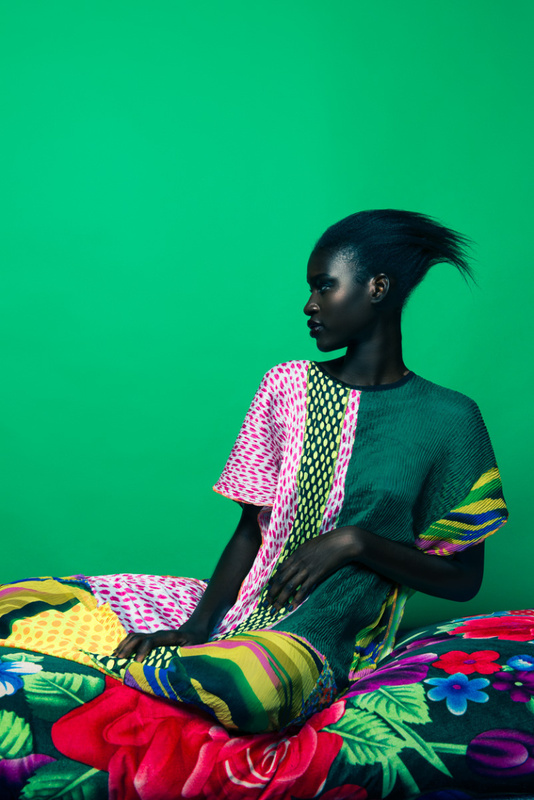 Notable examples of the trend include a recent collaboration between the South African designer Marianne Fassler and photographer Paul Samuels, described as a tribute to “exoticism, relaxation and the brand’s unapologetic approach to maximalism”. 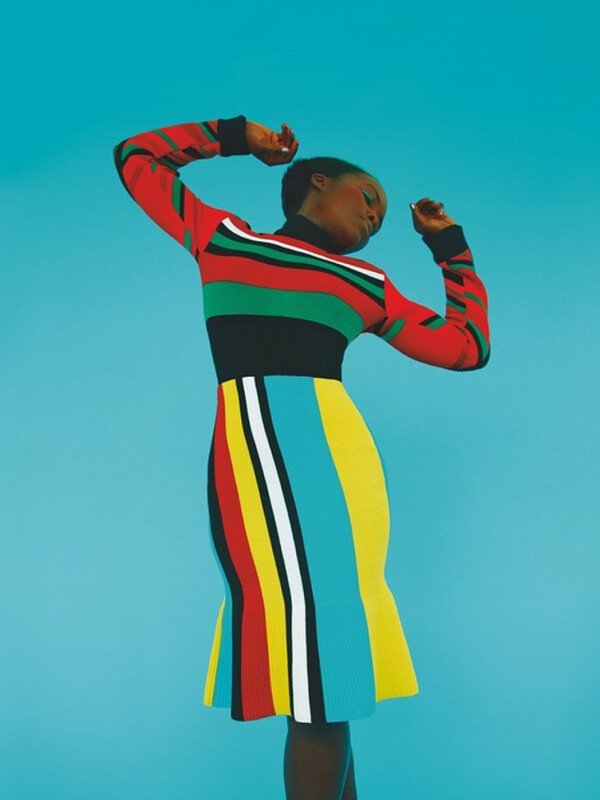 Erik Madigan Heck’s “chromogenic” shots of Lupita Nyong’o for the Guardian. Afrofuturist elements can be found in all of these pictures, particularly in the way they render racialised embodiment as visual stylisation, lifting the models from any recognizable context to more easily turn them into icons of a cosmopolitan style – a style where vibrant and bold hues signify, in the words of Victoria Rovine ” a vivid if nonspecific sense of temporality” (2015, unpaginated). This temporal sensibility, once again, references the historical awareness of the Afrofuturist who makes her past of uprootedness and migration productive of new identities. However, the Afrosartorial aesthetic all too often erases history in favour of geography, abstracting context and erasing the background to project on it a biased expectation of mobility as the ultimate means of emancipation. 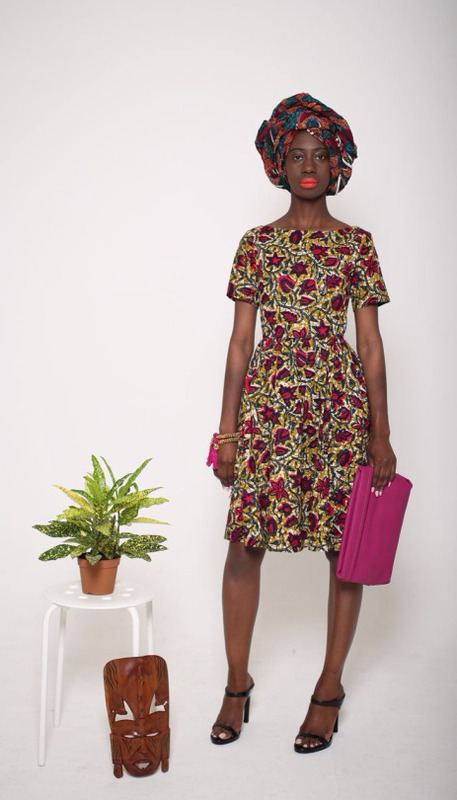 While there is nothing wrong in acknowledging that Africans are cosmopolitan citizens, this signification of the glamorous African body is problematic as it erases any element of identity and identification from the pictures – the same elements that designers incessantly cite as the added value of their collections. The power of fashion as storytelling could and should be better foregrounded. Fashion brands – big and small, acclaimed and emerging ones, – are at the forefront of a creative revolution that can upend monolithic visions of progress. Many designers have already taken advantage of their visibility to comment upon and indeed offer customers and audiences an inclusive vision of cosmopolitanism that makes room for multiple histories of movement and transition, rather than reproduce the utopia of linear progress that equates expatriation with success. What of the migrants that leave their home countries to work in the garment factories of Ethiopia or Kenya? What of the aspiring designers who employ women who have fled their villages in search of a better life elsewhere? 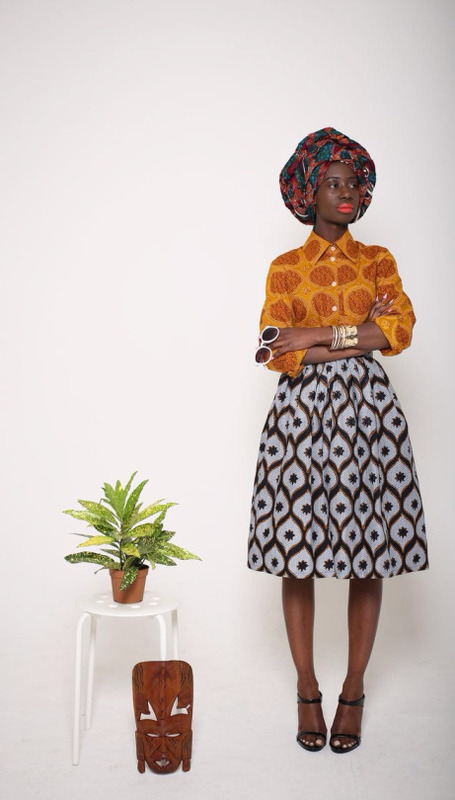 Africans have always been cosmopolitan citizens, but often cosmopolitanism has been imposed on them with unexpected consequences for the evolution of sartorial and aesthetic sensibilities on the continent and in the diaspora. Perhaps designers could make an effort to not stick with just one visual register and experiment with different ways to celebrate the iconic beauty of their designs and the models who promote them, making room for creative reinventions of local and global histories of Afrodiasporic mobility.